UNITED NATIONS, Dec 16 2013 (IPS) - As the ongoing crises in some of the world’s hot spots – including Syria, the Central African Republic, Mali, Libya, Palestine and Darfur, Sudan – continue unabated, Secretary-General Ban Ki-moon Monday singled out some of the biggest challenges facing the international community in 2014. 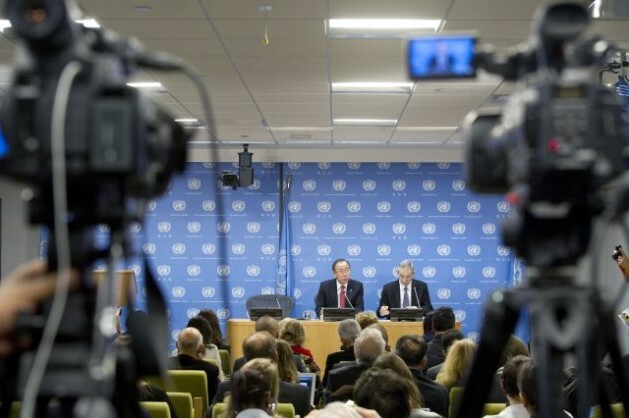 At his traditional year-end press conference, Ban said 2013 was the year in which the Syrian conflict, now in its fourth year of relentless killings, has “deteriorated beyond all imagination”. “The people of Syria cannot afford another year, another month, even another day of brutality and destruction,” he added. And 2013, he noted, was also the year in which the Central African Republic “descended into chaos”. The situation in the Central African Republic has become “one of the most serious crisis issues for the United Nations to manage,” he said. “I am gravely concerned about the imminent danger of mass atrocities,” Ban warned, appealing to the country’s transitional authorities to protect people. The crisis in both Syria and the Central African Republic will remain two of the primary issues high on the U.N. political agenda in 2014. The Syrian crisis is furthest from a resolution since the Security Council remains deadlocked with two veto-wielding permanent members, Russia and China, opposed to any sanctions against the beleaguered regime of President Bashar al-Assad. A conference of the warring parties is scheduled to take place Jan. 22 in Geneva. But it is in danger of unraveling over several contentious issues, including the composition of the rebel forces’ representation at the conference, and whether or not Iran and Saudi Arabia should participate, besides the five permanent members of the Security Council, namely the United States, UK, France, Russia, China, plus Germany (P5+1). Meanwhile, the fighting between the government and rebel forces in the Central African Republic has been temporarily thwarted with the deployment of French and African forces. But as the battle intensifies, Ban is expected to call for an upgrade of the joint military force, called the International Support Mission for the Central African Republic, into a full-fledged U.N. peacekeeping force. Asked about the important lessons he may have drawn after six years in office, Ban said he was “just amazed there are still so many challenges unresolved”. The number of crises now seems to be increasing than during his first term, which began in January 2007. At that time, the situation in Darfur was the most serious issue, he said. “Now you have so many issues,” said Ban, specifically Syria, the Central African Republic and Mali. Making a strong case for international collaboration, he said “nobody, no organisation, no country, however powerful, however resourceful” can singlehandedly resolve the current crop of problems. But he cautioned that he himself or even the United Nations cannot do it alone. “We need support from many regional and sub-regional organisations,” he said. As the situation in Syria continued to deteriorate, there was a humanitarian appeal Monday for a staggering 6.5 billion dollars in funds. The collective appeal came from several U.N. agencies involved in humanitarian assistance to 9.5 million people affected by the fighting in Syria. The U.N.’s Emergency Relief Coordinator Valerie Amos, and the U.N. High Commissioner for Refugees, Antonio Guterres, described the crisis as “appalling”. At the press briefing, Ban also laid out some of the key success stories of 2013. Alongside the new and ongoing crises, he said, 2013 was also a promising year for diplomacy. At the same time, member states agreed on a roadmap for shaping the post-2015 development agenda, which will include a new set of Sustainable Development Goals (SDGs), a logical successor to the U.N.’s Millennium Development Goals (MDGs) whose deadline is 2015. And across the Sahel and West Africa, peacekeeping and mediation promoted stability, with the people of Mali conducting peaceful legislative elections last week. Saturday’s “bombing attack in Kidal will not deter us,” he added. Ban also referred to “another highlight of 2013”: the agreement reached last month between Iran and the P5+1 countries on Iran’s nuclear programme. “I hope this initial understanding will be followed by a comprehensive agreement on all outstanding concerns,” he declared. Finally, 2013 will be remembered, he said, as the year in which the world bid a sad but celebratory farewell to former South African President Nelson Mandela. “I can think of nothing I would rather see in 2014 than for world leaders to emulate his example in upholding their moral and political responsibilities,” Ban said. certainly not; not whilst israel and amerika are fomenting trouble spots around the world. they could help by deleting the funding to rebels in syria and by withdrawing nose from the congo.